"I'm not sure how 'Greek' this is. However, my father made this, his parents came from Cephalonia, and he called it 'Greek stew.' As with many such recipes, the leftovers are even better a day or two later." Prepare a Dutch oven or large pot with cooking spray. Heat 1 tablespoon olive oil in Dutch oven over medium heat. Cook and stir onion and garlic in hot oil until onion soft and translucent, about 5 minutes. Remove onion mixture to a bowl. Heat remaining olive oil in the pot again over medium heat. Cook chicken in hot oil, turning a few times, until browned, about 5 minutes. Pour wine over the chicken; bring to a simmer and cook until chicken is no longer pink in the center, about 15 minutes. Stir onion mixture, tomato sauce, black pepper, lemon juice, hot pepper sauce, and cinnamon with the simmering chicken; bring to a boil, reduce heat to low, place a cover on the pot, and cook at a simmer until the chicken is easily pulled apart, about 1 hour. A delicious stew that’s ripe with the flavors of Greece! Serve with a Greek salad and bread for sopping. As kids, the sopped bread was the main course for us, and the chicken was a side. 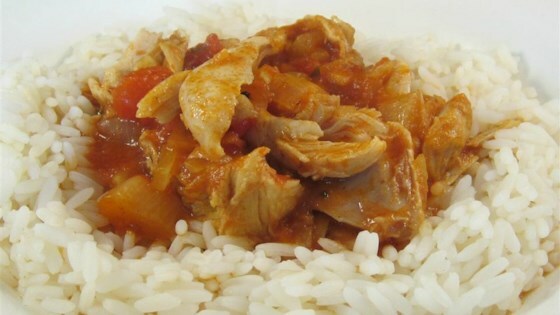 Substitute any cooked rice for bread and put stew over the rice. Very tasty! The chicken cooked up tender and juicy. The flavours were a wonderful treat ranging from the citrus and tomato to the nutty cinnamon. Thank you Craig Chandler for your recipe. This recipe was just okay. It was bland and quite watery. Probably won't make this again.